A Seditious Affair by KJ Charles is one of the best books I’ve read all year. The romance, the politics, the history, everything combines to a near-perfect whole. It’s not a stand-alone and readers who skip A Fashionable Indulgence, the first in the Society of Gentlemen series, will miss quite a lot as much of the action takes place concurrently and nearly all of the characters are introduced in the first book. Silas Mason is a radical pamphleteer and bookseller, outraged by the Peterloo Massacre in particular and the plight of the poor in general. He also has a long-standing weekly assignation with a man he calls “Tory”. Dominic Frey is a gentleman, well-born and wealthy. And he works for the Home Office, the part of the government in charge of harassing, silencing, arresting and sometimes executing men like Silas. While they both suspect that outside their weekly trysts, they might be enemies, they have remained in deep denial as long as they could. But when the Home Office starts targeting Silas’ friend Harry, and by extension, Silas himself, suddenly their differences become all too real. Oh goodness gracious this book was fraught. There are the personal difficulties between Silas and Dominic, which are non-trivial given their differing politics, and the historical realities of gay relationships in the Regency period. There’s the class conflict. And there’s the fact that these two are falling in love just as political tensions worsen. Really, they suffer. Of course, that’s no less than I’ve come to expect from Charles, who is a master at this. There’s real conflict here at every possible level. It’s quite delicious for those of us who love that sort of thing. I will say that the ending of Seditious Affair was about what I expected given all of the above, but isn’t entirely the blithe happily ever after that I would wish for these two after seeing them travel such a long way. One thing I appreciate about Charles’ historical romances is just this sort of thing–it’s hard to see how far we’ve come without honestly portraying the injustices of the past. I think Charles strikes a good balance between respect and hopefulness and accuracy, but of course, it’s subject to individual interpretation. I don’t have any quibbles with the ending from a narrative perspective–there’s a certain amount of secrecy that’s going to be involved just given the time period–but the class difference here leaves a little more of a gap between Silas and Dominic than it did with Harry and Julius in the previous book. I’m being quite cagey as I don’t want to ruin the ending for anyone. But I will be curious to see how this relationship is developed (if at all) in the upcoming third book featuring Dominic’s friend and former lover Richard. Speaking of the injustices of the past, it’s hard to read this series without drawing parallels to current issues of income inequality, access to healthcare, racial discrimination and other ways in which we still fall short as a society. From this book in particular, it’s clear that there’s nothing in new in some populations being treated differently by law enforcement and by the courts. There’s also a more detailed picture painted of society outside the ballrooms and gentleman’s clubs of many a Regency romance–one where Bow Street Runners aren’t the heroes and Dukes are feared. It represents a shift in perspective that seems to speak loudly to present-day inequity. A Seditious Affair isn’t an easy read, but it’s an altogether rewarding one. I’m consistently impressed by what Charles is able to achieve through the medium of historical romance. I think here she offers the best of what the genre can be, both in swoony portrayals of love and life within a historical context. A Seditious Affair just continues a streak of utter excellence. A few weeks ago, I tweeted a photo of a flaming pudding before I read Midnight Clear and ran across the Baked Alaska I posted last week. Apparently now if I can’t set a thing on fire, I’m not interested! Anyway, I didn’t know what the pudding I had a photo of was, but a couple of my British friends chimed in to say it was a Christmas pudding. Well, I didn’t know what that was either. I’m American! We don’t do puddings. Or, at least, when we do they’re smooth, creamy concoctions, usually with bananas and Nilla wafers. Or bread pudding, which is equally not the same thing. Luckily KJ Charles came to my rescue with a recipe! And oh, what a recipe. Not only is this pudding delicious, it dates at least to the 1850s, having been handed down through her family. Considering A Seditious Affair was coming out in December (though there really isn’t any Christmas connection), I just knew I had to try it. 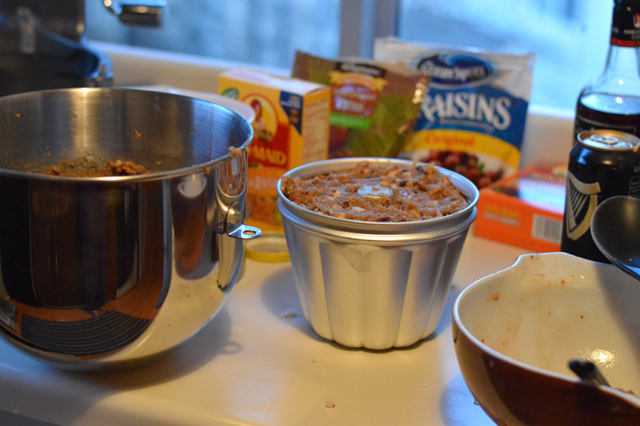 I should warn you–this recipe is an exercise in waiting. I had to wait for the pudding basin I ordered from Amazon to arrive. I had to soak the dried fruit for 24 hours (which ended up being more like 72 when I got busy at work). Then after I assembled it, it had to steam for 5 hours. Then I put it away for weeks (sadly only three in this case, but one recipe I read said you could leave it for six weeks, or up to a year in the freezer). Then you’re supposed to steam it again for 5 hours on Christmas. But patience is definitely rewarded. It’s dense with dried fruit and nuts and so boozy the fumes could get a person tipsy. Unlike the dreaded fruitcake, it’s moist and flavorful and really impressive when you set it on fire. Yes, sorry, I still think that’s really fun. 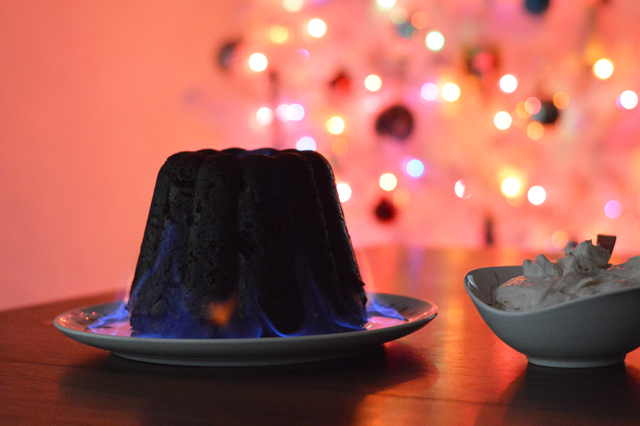 There’s nothing really tricky about the pudding until you get to the setting it all on fire part. I’ve tried to help out a bit with that in the notes. Oh, and the finding a pudding basin part (at least if you’re in the US). I got mine on Amazon. I didn’t change the recipe at all (1850s!) 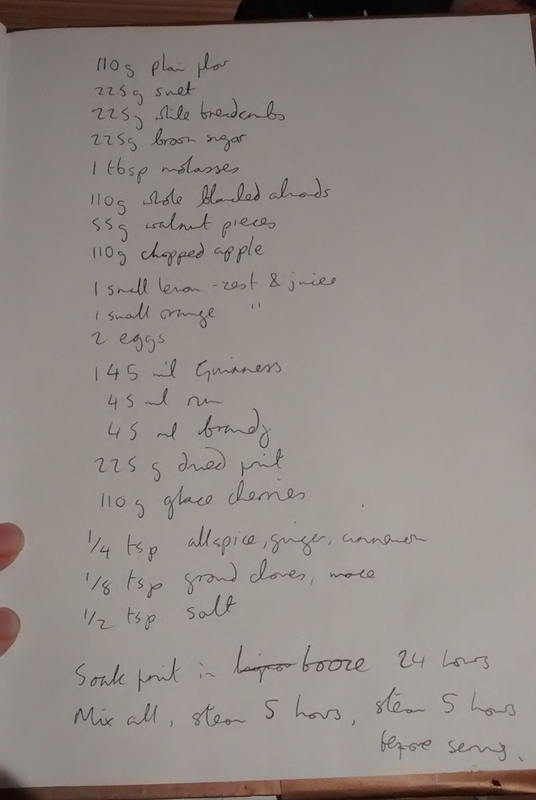 but I did reorder it from the ingredient list above just to clarify what you do when, especially for those of us who have never seen a Christmas pudding before much less made one. This is a pretty spectacular end to a particularly lovely holiday season, at least here at Cooking Up Romance. I hope your Christmas is a splendid one! Disclosure: I am friendly with the author and received a copy of A Seditious Affair for review purposes from NetGalley. Six weeks before Christmas, soak the dried fruit in alcohol for 24 hours. Grease your pudding basin with butter, lard or shortening. Pack mixture into your pudding basin and secure the top. Wrap the entire basin in aluminum foil to ensure no water leaks into the basin. Put basin in a large pot and fill with water about two-thirds up the side. Heat to a simmer and cover. Steam for five hours. Remove basin from the pot and put aside for 6 weeks or as long as you have (I only had 3 weeks and it turned out fine). I put the basin (still wrapped in foil) in my linen closet on a plate because it’s a little bit fatty. On Christmas, steam for another five hours. Un-mold onto a platter. Let stand while you make the hard sauce. With a hand mixer, combine butter, powdered sugar, vanilla extract and nutmeg. Mix until light and fluffy. Slowly add the brandy until well incorporated. Warm the brandy over low heat in a small saucepan, not allowing it to boil. Set fire to the alcohol in the pan and pour over the pudding (see notes). I got suet frozen from my butcher. It’s a type of hard animal fat. I have no idea if this is right, but I grated it with a cheese grater into the pudding mixture, which seems to have worked fine. Personally, I set fire to the alcohol and poured it over the pudding at the dining room table, but if you’re more safety-minded, you might want to do the pouring in the kitchen and bring the flaming pudding wherever you intend to eat it. 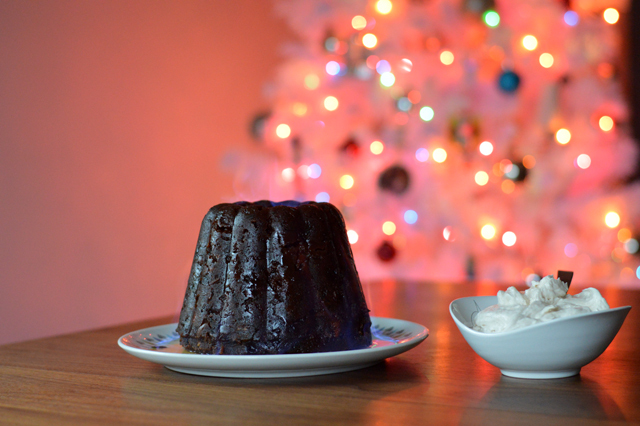 Your Christmas pudding looks absolutely beautiful! 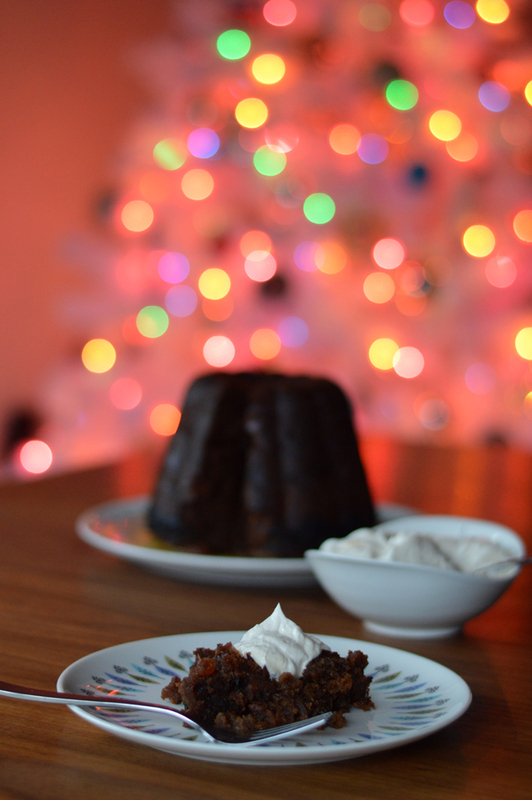 In Loyalist country Canada, it’s not uncommon, the Christmas pudding. I have an English friend who makes one every year for me and, I must say, the flambé-ing is the most thrilling part … also, the eating! Merry Christmas to you and yours! I hope next year you might try your hand at another of my favourite seasonal desserts, Austrian stollen! I loved your review (and the book) but I respectfully disagree about it not being a standalone. I read A Seditious Affair before I read A Fashionable Indulgence and I didn’t feel like I missed anything. I normally always want to read series books in order but in this case I think I actually enjoyed reading ASA before AFI.